The love story between Dimas, Raina, Gwenny and Toby. Dimas who is originally paired with Gwenny, turns to love Raina. Although Raina has the same feelings for Dimas, but she still feels guilty with Gwenny, because Raina and Gwenny are old friends. They are like siblings. On the other hand, her old friend, Toby, also put the same feeling for Raina. This situation makes Raina confused. 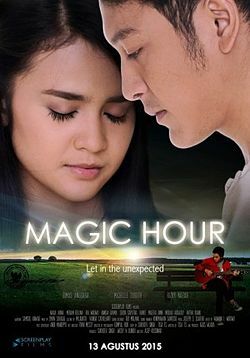 For Raina Dimas’ arrival in her life is like magic hour, magical moments that make Raina forgets all her griefs, until a secret is revealed. Raina knows the fact that Dimas is the cause of the accident that happened to her. Accident which claimed her eyesight.